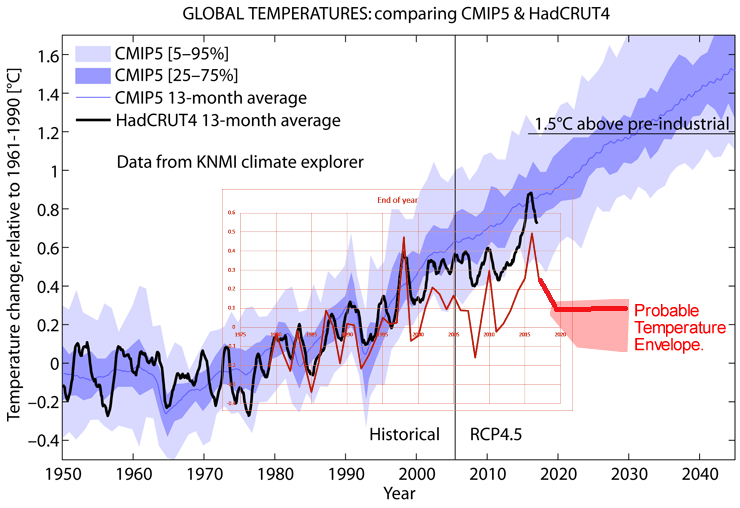 The abysmal track record of computer models in simulating climate trends has increasingly been highlighted in the scientific literature. 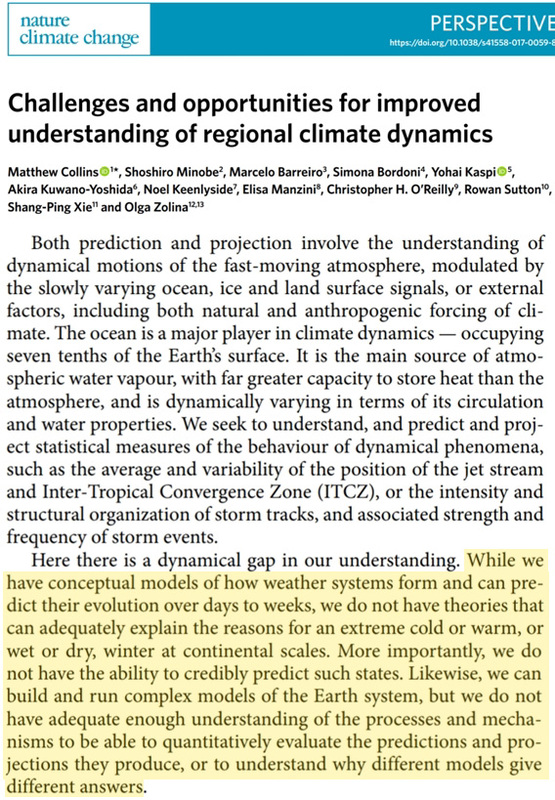 Recently published papers indicate that in some cases climate models actually get it right zero percent of the time (Luo et al., 2018; Hanna et al., 2018), or that hydrological models are off by a factor of 8 and 4 of 5 simulate trends opposite to real-world observations (Scanlon et al., 2018). Even the model-based assumption that positive water vapor feedback accompanies and amplifies CO2-forced temperature change is not supported by observations, with CO2 climate sensitivity overestimated by 200% (Ollila, 2018). 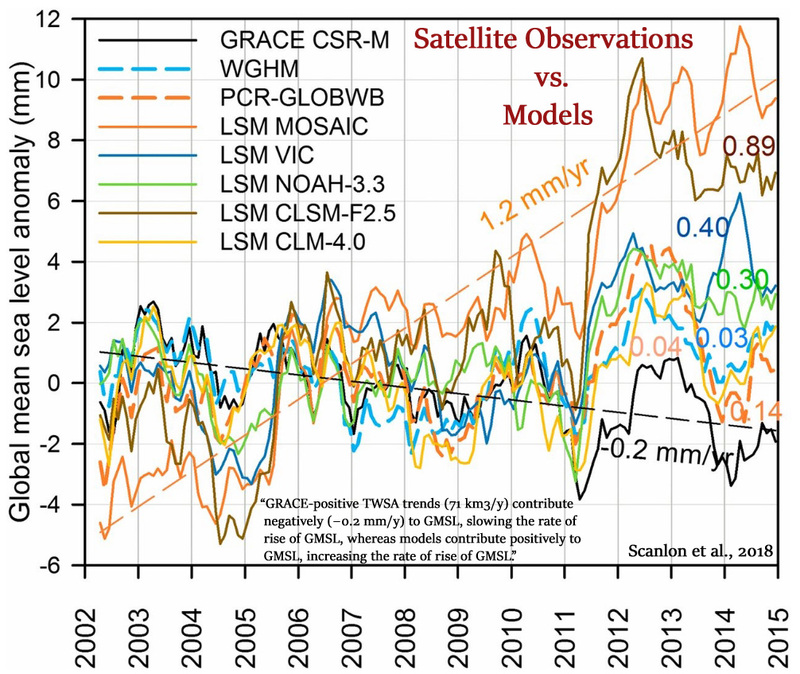 Simply put, climate modeling is increasingly being recognized in the scientific literature as lacking scientific merit. Nice to see published science is coming to grips with the CO2 warming effect is only a model artifact and not real. CO2 has never regulated, and will never regulate the climate, it’s not physically possible. AGW dreamers here’s your nightmare — enjoy. Next time it is sunny and hot where you are let the sun rays warm your forehead. Be careful not to look into the sun! Lit a match and hold it at arms length between your head and the sun. The heating sensation you now feel is caused by an effect very similar to back radiation. Sort of a sun ray turbo booster. This is why TMAX readings everywhere are constantly going up. The ‘back radiation’ is only normal solar energy redirected via humidity and clouds’ water molecules back to earth. It is not nor ever have been ‘new’ energy, just redirected and delayed energy that will eventually leave the planet via radiation to the vacuum of space. The main confusion with it is from peoples muddled thinking about IR, energy, heat, temperature and the movements of these. All too often so called experts mix heat with IR, or energy flux, temperature, and generalized ideas of heating and cooling. Keep it all as energy and movement and the picture is clear. Trying to ascertain and quantify CO2’s ‘back radiation’ is far more problematical as CO2 warming of any kind, on this planet’s lower atmosphere has only been guessed at, and never observed. IMO this planet’s ~33°C above it’s assumed blackbody temperature is only an effect of gravity/pressure on the lower dynamic atmosphere. I was pulling your leg 8-). TMAX is NOT increasing anywhere. If TMAX was increasing because of BR we would have a perpetual machine. Naturally coming out of LIA requires that the planet will warm, and that if the climate continues to warm the weather and climate will become more benign (based on historical record). If it cools again (which IMO seems likely) then the weather will gradually become more erratic and less predictable with more extremes (with both localized hot and cold events), as the climate system chaotically attempts (and always will fail) to find a new stasis point. You guys don’t seem to understand how backradiation works as a response to temperature and as a setter of temperature. What happens when you increase the insulation around a heat source? The heat content increases and therefore temperature increases until the flux through the insulation layer increases to match the output of the heat source. Now, our planet is no significant heat source, but the properties of the atmosphere allow shortwave radiation to pass through relatively free, but the re-emitted (from the surface) longwave radiation has it’s problems. It gets absorbed and re-emitted back towards the surface, and back and forth. It’s not that complicated and it too increases the heat content beyond what it would be without an atmosphere like this. At the top of the atmosphere, this planet still radiates to space with its blackbody temperature. If anything changes with the composition of the atmosphere this effect obviously changes too. And yes, that has been observed and yes you can easily observe (and feel) back radiation yourself. I applaud you that you marked it as your opinion. It’s ok to have an opinion detached from reality. Maybe skeptics should do this more often instead of marking the claims as facts or actual facts as propaganda/fake because they don’t match their opinion? More fabrication from seb, ignored! Seb, the average temp increase we have seen since 1980 is because of milder nights and winters. Summer highs are not increasing (Yes I know media is saying differently). If backradiation really boosted the sun rays as I joked above there should be a dramatic increase in summer mid day temps. To me it looks as something insulate from cooling and not boosting heat. ROFLMAO.. total and utter BS. CO2 does NOT increase the “insulation”. CO2 conducts energy better than normal air (proven by measurement) because of it radiative properties. It is noted that you still haven’t got passed the very basic but totally WRONG explanation of the AGW farce, totally ignoring remittance relaxation times vs collisional times for atmospheric molecules..
but hey, ignoring physics was always your only method of maintaining your borg-like brain-hosing. Your opinions are nothing but an anti-science fantasy, seb.. which is what makes them so LAUGHABLE when you just keep mindlessly regurgitating those scientifically unsupportable fallacies. Ah the seb DENIAL of the gravity-thermal gradient effect that measurably occurs on every known planet with a viable atmosphere. 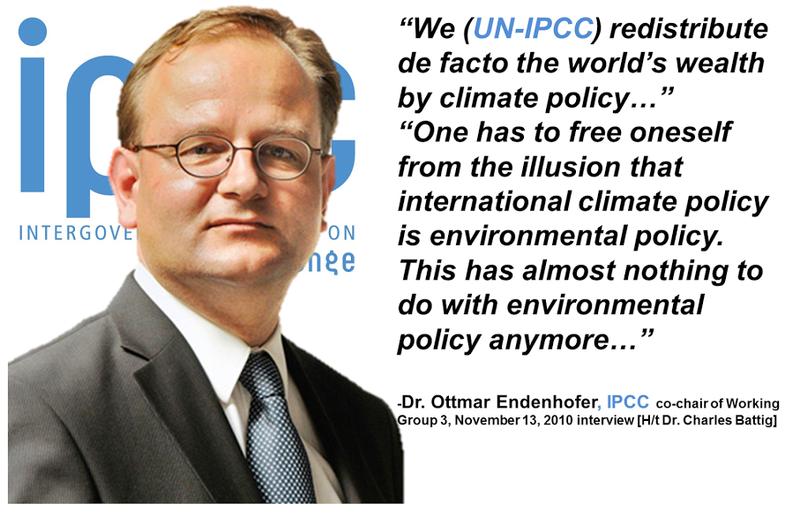 This against the un-measured purely baseless anti-science conjecture of warming by atmospheric CO2. AGW is NOTHING but a mindless, baseless cult-like religion. and leave real science to others. ! From H2O, which is up there because its done, or in many cases over-done, its cooling job….. not from CO2.. and the fact that it greatly changes the lapse rate of cooling. Convection and conduction RULE the lower atmosphere. The release of latent energy also has a huge effect in the evening as clouds form. The only places where any pitiful back-radiation from CO2 could possible be sensed, if it actually existed, is in the desert or at the poles. And the deserts cool rapidly at night ,show just how INEFFECTIVE any mythical CO2 back-radiation is. Point is that CO2 doesn’t get the chance to re-emit anyway. Thermalisation takes care of that. Your understanding of atmospheric physics is extremely BASIC, and LIMITED to the nonsense taught to you in junior high or by AGW cultist, isn’t it, seb. If you go into a large commercial glasshouse on a bright sunny day the hottest place is near the roof, the taller the glasshouse building the more hot air accumulates near the roof (the hotter the higher). In the unconstrained troposphere the warmest air is near the ground (the colder the higher). If the ‘back-radiation’ theory were to work then it would perform in a large glasshouse, forcing the near ground level to be warmer than the near roof. It does not happen because it is not real physical science — it is a hypothesis (aka a guess) at what really happens. There are no two different types of insulation. The effect is always the same one. Oh please stop it. Yes, we know the GHE is not working the same way as warming in a real greenhouse does. If the ‘back-radiation’ theory were to work then it would perform in a large glasshouse, forcing the near ground level to be warmer than the near roof. 1) Backradiation is no theory. You can measure it, you can feel it, it’s there. No amount of quotation marks and putting the word “theory” next to it will change that. 2) Backradation is performing in a large glasshouse as well. 3) And no, backradiation doesn’t work like that. It does not happen because it is not real physical science — it is a hypothesis (aka a guess) at what really happens. Indeed, it is not “real physical science” what you are claiming/explaining here. Backradiation is no theory. You can measure it, you can feel it, it’s there. No amount of quotation marks and putting the word “theory” next to it will change that. Great. You can feel it. Since you can measure how much CO2 backradiation warms water bodies when increased by parts per million, how much warming is caused in water bodies by raising CO2 concentrations by 10 ppm? What are the physical, real-world measurements? Do you have them? Uh, that doesn’t tell us anything about what the net real-world results of the changing backradiation values alleged for CO2. If we don’t have real-world measurements for what these backradiation values do in the real world, what are these alleged values worth? Besides, the uncertainty associated with the heat flux values are far larger (5 to 10 times greater) than the alleged forcing values for anthropogenic CO2, meaning we effectively cannot detect a signal in all the noise. Yes we know that FACTS and REALITY are incomprehensible to you. Just a simple, “I don’t understand” is all you needed to say.. but that is totally obvious. So much NON-information in your every post seb.. EMPTY !! Your base-level ignorance to do with all things latent heat and evaporation is very well established. Do you have ANY REAL SCIENCE to show that enhanced atmospheric CO2 does ANYTHING except enhance plant growth. Where’s that empirical evidence for CO2 warming, seb? Just remain the EMPTY-OF-SCIENCE little sad-seb that you have always been. Its pathetic, really. SIGH !!! Let us know next time you can feel the mythical back-radiation from CO2. seb. In your little FANTASY world…. Only time you can feel any radiation from H2O is when its already done its cooling job. You do know that is how it gets up into the sky, don’t you seb? Even a mindless little Chihuahua knows that evaporation of H2O cools him down. Yet you seem to be blithely UNAWARE…. Great. You can feel it. Since you are a fan of experiments: go outside in a cold (winter) clear sky night. Look at the stars and then put a sheet of paper between you and the night sky. You will feel the difference on your face. Since you can measure how much CO2 backradiation warms water bodies when increased by parts per million, how much warming is caused in water bodies by raising CO2 concentrations by 10 ppm? What are the physical, real-world measurements? Do you have them? Great job Kenneth, proposing a near impossible experiment (how would you change the CO2 concentration in the entire column over an area of the ocean and make sure no horizontal mixing with the surrounding area occurs in the water and in the air?) to convince yourself that the effect isn’t real 😉 Of course you aren’t accepting faster proxies (clouds) for CO2 backradiation changes (that can be measured) in this case … otherwise you’d have to accept that the oceans warm and cool with backradiation changes too. What we can do is measuring backradiation. We can also measure how water (oceans) react to a change in backradiation from a different source. And surprise, there are even papers about this subject. Who would have thought? We have measurements for changes of backradiation from changing cloud cover. The CO2 effect is of course smaller, but it is essentially the same thing. Besides, tomOmason seems to believe that there is no backradiation. So replying with a “manual” of how to measure it seems valid. If you need to believe that this rules out any effect … good for you that you can find a quote that enables you to justify your denial in all situations. P.S. : @moderators, did something change? I need to fill out the name/email fields every time now and not a single comment post return with it being in moderation (I guess because no comment cookie gets set and so the blog can’t show it to me). And that difference you feel on your face is due to the CO2 concentration? OK, so you admit that we DON’T have measurements that show results for the CO2 backradiation…even though we can feel it on our faces. So we can feel it, but we can’t measure it — and yet even though we can’t measure it, and even though the uncertainty in the heat flux is 5-10 times greater than the assumed CO2 forcing itself — the results of backradiation forcing from CO2 are NOT theoretical? Can this be any more contradictory/circular? It doesn’t even have to be an ocean. Any body of water can be used in a real-world experiment. How much does backradiation from CO2 forcing warm a body of water (a tub in a greenhouse, for example) in the real world? What are those measured results, SebastianH? The effect? I’m looking for the cause. How much warming does CO2 backradiation flux cause in a body of water? Where are the measurements, SebastianH? All you have are forcing values. Show us the measurements for what those forcing values really do to water temperatures. We have measurements for changes of backradiation from changing cloud cover. The CO2 effect is of course smaller, but it is essentially the same thing. How can the 4 W m-2 for doubled CO2 be “essentially the same thing” as the range for clouds (100 W m-2)? You’ve been caught fabricating again, SebastianH. I never wrote anything about the uncertainty magnitude for the heat flux “rules out the effect”. You just made that up. Notice that what I did write about was a quote the IPCC that identified the uncertainty range being 5-10 times greater than the alleged forcing change from CO2 itself. This perpetual dishonesty is exactly why we have a difficult time taking you seriously here. And then you have the audacity to claim that I am in “denial” about the effect of CO2 backradiation even though (a) we have no real-world measurements for the results from CO2 backradiation fluxes, and (b) the uncertainty in those values is 5-10 times greater than the alleged forcing value for CO2 itself? What could I possibly be denying if we can’t even be sure an anthropogenic signal can be detected amid the noise and uncertainty? Are you in denial that the uncertainty here is problematic? Apparently so. You dismiss uncertainty and just believe anyway. Hardly scientific. Seb.. just stop it, you are making total and utter goose out of yourself. If your junior high level of lack of education in physic and science is representative of the below average alarmist, no wonder you can’t provide any actual proof of anything you say. STOP DENYING the existence of evaporative cooling by H2O. STOP DENYING the existence of the PROVEN gravity thermal gradient control. STOP DENYING that the only reason H2O is up there is because it has COOLED the surface. The more DENY basic physics, the more brain-hosed and anti-science you look. And STOP making up stupid little fantasies, like CO2 warming anything, where you have absolutely ZERO proof to back up your arrant nonsense. ..and that CO2 is a NON-ENTITY. Its one tiny step towards a basic understanding for you, but you still have a LONG LONG way to go !! Must be your imaginitis playing is usual tricks again, hey seb. If I got the paper close enough, I could feel my breath heating the paper and the paper stopping convective cooling. But CO2 is not going to do either of those things, is it seb. FANTASY is the only case you have managed to put forward in the whole time you have graced us with your clown act. Oh no, not that Marty Feldman farce again ! Just chant the mantra, seb. !! ROFLMAO.. changing cloud cover means release of latent energy of condensation. Also means the slowing down of convection, so there is more H2O, which is a naturally radiative gas. The more of it is blocked from full convection, the more there is to radiate. You really don’t know much of anything about cloud physics, do you, seb !! Always.. seb, the unaware !! Sometimes I wonder if I am writing in Chinese or something. No, it’s the backradation from the paper of course. Ehm … are you trying to troll me? No, that is not what I am saying. Don’t make stuff up that I didn’t write. and yet even though we can’t measure it, and even though the uncertainty in the heat flux is 5-10 times greater than the assumed CO2 forcing itself — the results of backradiation forcing from CO2 are NOT theoretical? Can this be any more contradictory/circular? That contradiction only exists in your mind. The backradiation from CO2 can be measured and has been measured. It’s not rocket science. And we also know what a change in backradiation does to water because we actually measured it. What we didn’t measure is if a change of the CO2 part of the backradiation results in the same thing. Why? Because it is damn near impossible to perform this experiment without a second Earth. And that is why you are so eager to emphasize this supposedly missing evidence and construct the nonsense claim from it, that CO2 concentration changes have no effect on ocean heat content. In reality that doesn’t follow. Analogies could help to visualize the problem for you, but since you immediately shut down then, you’ll have to live with not understanding the basics of what you are arguing against. A tub in a greenhouse … seriously? Do you really think that is an accurate setup to measure the GHE of CO2? All you have are forcing values. Show us the measurements for what those forcing values really do to water temperatures. As you probably know, measurements for larger forcings (clouds) exist, but it is damn near impossible to measure the difference between different CO2 concentrations because we can’t manipulate the CO2 concentration on a short enough timeframe. That’s why you are asking for these specific measurements … as if you are expecting that something completely unexpected would happen in such a scenario. How much smaller is the CO2 effect relative to cloud cover changes, SebastianH? According to RealClimate, the difference is overwhelming, suggesting it could be difficult to detect the anthropogenic signal relative to cloud cover changes: […] How can the 4 W m-2 for doubled CO2 be “essentially the same thing” as the range for clouds (100 W m-2)? You do know that the author doesn’t mean the global cloud cover, right? Just making sure. It is essentially the same thing only on a different scale. And since the effect of an increased CO2 backradiation is a continuous one, it adds up. You’ve been caught fabricating again, SebastianH. I’d be rich if I got money for every time you made up something I didn’t write. Should I keep a count? And no, I didn’t. Yep, you wrote “we effectively cannot detect a signal” in the “alleged” forcing values. Then stop being dishonest and accuse me of being just that. If you aren’t making up the stuff you think I wrote, then you haven’t understood what I wrote and just replied in the usual skeptics reflex way. Either way, that’s a sad way to communicate. Are you in denial that the uncertainty here is problematic? Apparently so. See? Turning the accusation around at your opponent is also no way to communicate as an adult. I am no dismissing uncertainty. I am dismissing re-interpretations of “blog scientists” like you. we also know what a change in backradiation does to water because we actually measured it. What we didn’t measure is if a change of the CO2 part of the backradiation results in the same thing. Thank you for admitting that we have no measurements that show what CO2 concentrations do (i.e., results) to water bodies when raised or lowered. The uncertainty is too great to clearly detect an anthropogenic signal amid the noise and amid all the other factors that contribute to backradiation. Well, that would be pretty much the most scientifically EMPTY and totally mindlessly brain-0hosed rant I have ever seen.. even from seb. At not one point did you deliver a coherent scientific argument about anything. Just mindless evasions and AGW farce. And STILL desperately trying to get around producing any evidence what-so-ever of warming by atmospheric CO2. So NOT from CO2, but from a solid object that actually block convection. You are NOT helping your cause seb, stop the clown act….. if you can. S: No, that is not what I am saying. Well do you have measurements … OR NOT !!! Fabrication and fantasy are the ONLY things you have left to you. … or produce empirical evidence. Or were you UNAWARE of that MEASURED fact. So much for increased DWLWR from increasing atmospheric CO2. We know the problem, seb. Find a mirror, an you will see it giggling inanely back at you. But you are desperate to never allow yourself to enter the world of REALITY. Your analogies are generally mindless, fatuous, juvenile, trite and totally irrelevant to any part of world reality. Just like the rest of your comments. That’s what makes them all so funny. What seb is also UNAWARE of is that the whole back-radiation from H2O thing is a furphy. If there is more H2O in the atmosphere, then the evaporation is slowed down, as is the rate of convective COOLING. So measurements based on radiation are meaningless. You can continue to believe that, Kenneth. Doesn’t make it correct though. I choose to accept that a small amount of LW radiation does exactly the same as a large amount of LW radiation except on a different scale … why? Because we haven’t discovered a law of physics yet, that says it should act different. As soon as you can present that, you’ve got me on your side regarding this argument of ours. We do have measurements for the CO2 backradiation, but we obviously can’t “feel” changes in CO2 concentration related radiation changes in ocean heat content. And that’s what Kenneth wrote about when he mentioned “we can feel it, but can’t measure it?”. Obviously a misunderstanding. The rest of your ramblings … not worth replying to. Yet another load of FANTASY and attention seeking BS from seb. You ADMIT you have absolutely NO MEASUREMENTS of CO2 warming anything.. WELL DONE. You ADMIT you have NOTHING but EMPTY zero-science platitudes, and mindless assumptions. You have also admitted you have ZERO comprehension of how convection and conduction CONTROL the lower atmosphere. YOU have never understood the principle of thermalisation ..
All you continue with is you mindless regurgitation of your anti-science AGW propaganda pap.. ZERO SCIENCE.. just fantasy seb. ROFLMAO.. what a load of monuMENTAL carp !! And totally IRRELEVENT to atmospheric CO2.. Yet another attempted and FAILED thought-bubble analogy. You are so used to having your head in a paper bag that you think putting a piece of paper between you and the stars actually means anything..
Just IMAGINE that you “FEEL” something. Just IMAGINE you had an intellectual thought !! But it didn’t happen, seb. and it never will. I admire your persistence but IMO it is lost. The AGW advocate it utterly indoctrinated and no amount of reason or science can change that. Their large store of personal capital and ego in the AGW project means that these people can not let go of their delusions no matter what. It matters not for them that their current comfortable existence relies so much on nature and the man-made. They are ignorant and misguided, fooled into thinking that change (based on this empty sustainability sophistry and ineffective CO2 worrying) will power them to a comfortable future. They do not see that in their modern life these changes will cause a decay into disasters. This cult-religion has them believe it’ll protect them by restraining their ability to think logically, or act with reason, they are adrift in a fantasy. No matter that these disasters will first affect millions of poorer people for that’s not them, so why should they be worried. It will get them eventually though, and by then the same charlatans and elites that preach the AGW sermon today will again be seeking profit from the disasters. So persist AndyG55. I prefer to just state reality of the situation as I see it (which is not set in stone), fire off a few deliberately provocative remarks, then sit back and laugh at the AGW advocate’s mostly pre-scripted cascade of unreasoned, often irrelevant, and anti-science comments. In the advocate’s delusion of a flat, modeled, timeless world of averaged and homogenized everything I’m sure they think it makes sense. However on this three dimensional water planet, where everything is not known; on a world of dynamic, chaotic, localized action and reaction to solar and cosmic events, things are radically different from those modeled outcomes and imaginative suppositions. Thanks for yet another excellent compilation. What could be clearer? The IPCC itself said in 2007 that it doesn’t even know what metrics to put into the models to test their reliability. That is, it doesn’t know what future temperatures will be and therefore can’t calculate the climate sensitivity to CO2. This also begs a further question of what erroneous assumptions (e.g., that CO2 is the main climate driver) went into the “plausible” models to be tested any way. I am new here but still, please give those AGW killer posts in small portions. I want to be able to enjoy every moment of this AGW house of cards falling apart. Except the above collection is not capable of doing that. I wish I had more time to elaborate why, but let’s just say finding something that a model doesn’t cover correctly is an opportunity to improve the model. And if that something is only a small part and they generally get it right (and they do, don’t believe a guy like Christy with his own temperature graphs that are not like any other). Yet you don’t recognise the “opinion piece” status of 97%+ of anti-science AGW papers. But then, your opinion is worthless anyway. You really do only have one eye, don’t you seb, and it has tunnel vision. We are all glad you don’t have more time to rant…. …. it would be a load of mindless drivel anyway. Oh man.. how GULLIBLE are you !!! LOL !!! Against REALITY, the models are a TOTAL FARCE, and as the slow cooling trend continues will become the LAUGHING STOCK of the science community. Remember , this graph uses RCP4.5 which is nowhere near what is really happening with the CONTINUED RISE of atmospheric CO2, to the BENEFIT of all life on Earth. This is happening because President Trump had the balls to call B.S. on climate change. Real scientists are now speaking out after years of repression. Poor seb, attempted distraction yet again. PATHETIC. Nobody gives any weight to fringe extremist views like yours seb. You are nuisance value only, and proven WRONG at every step. You are LAUGHED at . proven WRONG at every step. You are LAUGHED at . And your warped perception of reality is based on nothing but fairy-tale novels and anti-science gibberish. The really funny thing is your wilful and deliberate desperation to remain in that fantasy la-la-land that you mind inhabits. You have absolutely zero intent on ever getting back to REALITY. You mean the 30,000 plus scientists at Petitionproject.org mean more than the 77 “climate scientists” of Zimmermen/Doran fame? Those 77 were the remains of the 10,250 where were sent the survey, and 7,000 didn’t even reply,so those 77 have been driving this whole scam. A policy to limit carbon emissions (via tax, via cap and trade, or even via shaming in the media) will reduce the value of owning a coal deposit or an oil well. And in the presence of a continued demand for energy, will increase the value of other assets, like a high plateau suitable for wind farms, or a great river suitable for hydropower, or a deposit of pitchblende from which one can refine fuel for a reactor. Most people don’t think as deeply on these matters as Edenhoffer. (It is, after all, his job to think deeply on these matters.) And Americans in particular have for many years associated the phrase “redistribution of wealth” with active schemes to tax the wealthy in order to provide economic support to the poor. In the context of the quote, though, it’s clear that Edenhoffer is not discussing transfer payments at all, but rather the fact that climate policy alters the value of national assets world wide. poor seb, squirming like crazy to avoid what has been said by his masters. He said what he said. GET OVER IT !! Thank you for realizing that. And the purpose of redistributing the wealth is . . . ? I think it’s to reduce the standard of living of those of us who still have the possibility of fighting against the planned global oligarchy. Among other things. So these papers show that the settled science of CO2 warming is wrong. The implication is that EVERYTHING done to mitigate CO2 levels is not required — diluting petrol with ethanol, burning wood instead of coal, installing massively subsidized wind and solar junk, the big push to unsustainable electric vehicles, etc. ALL THIS CO2 MITIGATION IS WRONG — IT IS FUTILE! The only reason it will stay is for political reasons – to control the populous, allowing the political elites and their economic cronies to accrue more power and wealth at the expense of the poorest in society. Tomomason, if we’re actually looking for the motives of the AGW hoax, shouldn’t w be looking at ALL the results? Certainly you’re right that oligarchs are making huge profits in manufacturing the paraphernalia required to replace “fossil” fuels, but I wonder if the other results aren’t also intentional. — nearly-global slowing in growth, due to misapplication of investment, AND paying 3d world not to develop energy resources. If this wasn’t on purpose, it was certainly predictable. — Supplies the propaganda to establish the necessity for global transformation, much of which is spelled out in obscure bureaucratese in Agenda 21’s Handbook. Its application includes draconian land-use laws which concentrate worldwide populations into cities so that everything else is re-wilded. Think Controlling people through land-use. In California 80% of housing construction was single-family 2000-2010. New laws provide that 68% of CA housing must by 2035 be condos or apt complexes. Two US national laws are the 2006 Global Warming Solutions Act, and the 2008 Sustainable Communities and Climate Protection Act. The AGW hoax is not being driven by science, so what IS driving it? Science. You obviously got it wrong. Just another mindless attention-seeking comment from seb, the zero-science AGW-cultist. We should be examining and fighting these things more. Every dumb advocate, and their stupid unscientific assertions should be challenged, their ridiculous impractical mediation measures fought, so that the all people (worldwide) can have the opportunity to progress, and not regress into some Green Blob inspired medieval hell-hole. Only the most gullible still fall for that sort of junk science/propaganda. But there are a lot of very gullible people out there. ! The AGW conjecture is based the existence of a radiant greenhouse effect caused by trace gases with LWIR absorption bands. Such a radiant greenhouse effect has not been observed in a real greenhouse, in the Earth’s climate system, or anywhere else in the solar system. The radiant greenhouse effect is science fiction so hence the AGW conjecture is science fiction as well. If CO2 really caused global warming then one would expect that the increase in CO2 over the past 30 years would have caused at least a measurable increase in the dry lapse rate in the troposphere but that has not happened. If they really knew what they were doing they would have only one model with no fudge factors. The fact that they have been using a plethora of models leads one to believe that a lot of guess work has been involved. They have hard coded that more CO2 causes warming so that is what the simulations show. Doing this begs the questions and renders their climate simulations as useless. These climate simulations are nothing more than fantasy and have nothing to do with the real world. The positive feedback idea is that CO2 caused warming caused more H2O to enter the atmosphere which causes more warming because H2O is also a greenhouse gas and in fact H2O, molecule per molecule, is a stronger absorber of IR radiation than is CO2. The AGW conjecture completely ignores the fact that besides being the primary greenhouse gas, H2O is a primary coolant in the Earth’s atmosphere moving heat energy from the Earth’s surface. which is mostly some form of H2O, to where clouds form via the heat of vaporization. As evidenced by the fact that the wet lapse rate is significantly less than the dry lapse rate, H2O is a net coolant so that if H2O provides any feedback, that feedback is negative. There is plenty of scientific rational to support the idea that the climate sensitivity of CO2 is zero. The AGW conjecture is based the existence of a radiant greenhouse effect caused by trace gases with LWIR absorption bands. Such a radiant greenhouse effect has not been observed in a real greenhouse, in the Earth’s climate system, or anywhere else in the solar system. Only the parts with the “real greenhouse” is somewhat true. Other than that, of course, we have observed it. It’s not hard to do so. That’s not even up to debate, Wiliam. A good skeptic knows that the thing he/she needs to be attacking it whether or not an increase in greenhouse gases has a measurable effect or is so small that it doesn’t really matter. Weren’t you in the briefings where they told you about this most promising strategy? If CO2 really caused global warming then one would expect that the increase in CO2 over the past 30 years would have caused at least a measurable increase in the dry lapse rate in the troposphere but that has not happened. Are you suggesting that the lapse rate could change when the surface temperature changes? If they really knew what they were doing they would have only one model with no fudge factors. The fact that they have been using a plethora of models leads one to believe that a lot of guess work has been involved. “They” are many thousands of scientists and everyone comes up with their own models and findings. About the guess work: if we wouldn’t have to guess, then we could predict the future perfectly. Do you think that is possible? To know the complete state you begin with and to know how everything exactly interacts which each other to predict a future state from it? So no, we have to guess and estimate some things. Those models aren’t about predicting something exactly, but to estimate the general direction of where climate is headed. They are also quite good to determine what the change of a variable like the amount of CO2 emitted does to those predictions. They have hard coded that more CO2 causes warming so that is what the simulations show. Doing this begs the questions and renders their climate simulations as useless. These climate simulations are nothing more than fantasy and have nothing to do with the real world. Umm, yes of course they did! As well as they probably modeled gravity according to the laws of physics and everything else that is involved. CO2 does cause warming, that has been known for over a century now. H2O is a net coolant so that if H2O provides any feedback, that feedback is negative. No, it’s not. Why would you claim something like this? Where are you getting your information from? There is zero rational here. You are acting like the tobacco industry did when finally someone “found out” that smoking tobacco kills and isn’t healthy at all. The amount of BS they dug out to convince the public that this is not the case is kind of unbelievable in hindsight. And now so called skeptics are doing the same regarding climate science and in support of fossil fuels. Why the hell are you afraid of change towards a generally better direction? I DARE you to provide empirical proof otherwise. Or you could just remain the brain-hosed anti-science LOSER that you have always been. This is just how it is..
Warming for atmospheric CO2.. Not observed. Your lapse rate comment shows you have zero comprehension about anything. H2O is most certainly the main COOLANT on the planet.. why are you DENYING basic physic again seb?? Again, seb. You are asked to provide empirical proof that enhanced CO2 does ANYTHING apart from enhancing plant growth. Your indignant mindless yapping of the AGW mantra when faced with actual FACTS is really very amusing. YIPPEE.. finally an admission of fact from seb. Nor does it slow cooling. I thought a miracle had happened and seb had finally discovered the truth. So ignore those last 3 lines. There is ZERO EMPIRICAL EVIDENCE that enhanced atmospheric CO2 causes any warming , ANYWHERE, ANYTIME, or ANYHOW. seb has continually backed up that FACT with his ABJECT FAILURE to produce any. There is a missing post not above this last one. Again. Will is CORRECT and you are WRONG. There is no evidence of warming by CO2, and any conclusion based on rational physics would show that warming from atmospheric CO2 is nothing but a myth. From H2O, which is up there because its done, or in many cases over-done, its cooling job….. not from CO2..
What nonsense are you coming up with this time ???? Chant the mantra seb.. because it ALL that you have. CO2 does cause warming, that has been known for over a century now. How much warming does it cause…in an atmosphere? How much warming does it cause in a body of water? What are the real-world physical measurements? seb and his elk are still stuck with the erroneous conjecture of a chemist 150 years ago. They have built that erroneous conjecture into erroneous models, but that is the only progress (lol) they can make while they stick to their anti-science fantasies. This doesn’t answer the question…and it’s another fabrication. (I haven’t written that the CO2 greenhouse effect is a “myth”; you wrote that and falsely claimed I did.) So I’ll ask the question again. You’ve written that “CO2 does cause warming”. So the next logical question is: How much? Quantify it. How much atmospheric and water body warming does CO2 cause? What are the physical measurements? What methods are used to extract these physical measurements to verify these results? And if we don’t have real-world measurements, is this a theoretical conceptualization? And there’s that PATHETIC *sign* of a defeated little child, again. And the usual zero-science content. Have you found any empirical data supporting the myth of CO2 warming yet, seb?? Or is it all just EMPTY BELIEF !! Because its NOT a better direction. Its a direction towards environmental and economic degradation. Starvation of plant-life, hence human populations. And your PATHETIC attempt to link to the tobacco lobby is really digging to the bottom of the AGW-cult sewer. The tobacco lobby pales into insignificance against the propaganda and lies of the AGW-cultist religion. It is YOU and your fellow AGW suckophants that are more like the tobacco lobbyists. … all part of the AGW scam. Don’t try to mirror everything skeptics are to your perceived “AGW enemies”. Feeble response, seb, even from you. You KNOW its the AGW cultist doing all the lobbying, and all the propaganda, bending data, and pushing every little bit of lie they can get away with. The AGW industry is the one who stand to lose billions once the truth comes out. And they are adopting tactics similar to the tobacco industry in their desperation. You have always been the one looking in the mirror as you rant, seb. Attention-seeking trolling is the only purpose of your posts. Your reason for being here. I have been saying for 2 decades that the modelers have the sign of CO2’s action backwards. Take an earth with no gh gases, and one with all gh gases. Both will still be heated by the sun, but the one with no gh gases will not cool as fast, since ALL cooling would be via conduction with the surface and that only when the surface has cooled below the atmosphere temperature. An atmosphere with all gh gases will ALL radiate, half to space, half toward earth. And the gh gas atmosphere would STILL cool via conduction, as the non-gh gas atmosphere. The point is that it WILL cool by other than conduction. So adding gh gases adds to cooling. That is right. It is the non-greenhouse gases that are more likely to trap heat energy because they are such poor LWIR radiators to space compared to the so called greenhouse gases. Heat transport by conduction and convection dominates over heat transport by LWIR absorption band radiation in the troposphere. Good absorbers are also good radiators. In the upper troposphere and the stratosphere it is the so called greenhouse gases that absorb heat energy transported by conduction and convection and then radiate that energy out to space. More so called greenhouse gases improve the Earth’s radiation to space and hence have a cooling effect, not a warming effect. And these are controlled vertically by the gravity induced temperature /pressure gradient. And horizontally by pressure differentials. Indeed if radiant energy from the sun is exchanged for kinetic energy moving molecules it CAN NOT ever be re-radiated as IR energy leaving the CO2 molecule. Once the CO2 molecule exchanges any amount of it’s IR energy to kinetic energy then no energy that it still has, can be re-radiated as IR energy. That is because transference of IR energy through the CO2 molecule happens only at a specific level and no other. Of course there will be some huffing and puffing about this from our AGW advocates. However unless anyone can show how many (of those 0.04ppm) CO2 molecules in the atmosphere acquire the correct solar IR energy (no they all don’t, they have to be in the correct orientation and energy level to do it), then measure (or calculate) the number of IR excited CO2 molecules that do not collide with other particles in the atmosphere, and thus are free to re-radiate, then there is nothing but ignorance. To date the indirect evidence is that CO2 does not warm the atmosphere, or if it does it’s so small as to be lost in all the other processes. The warming that is happening looks perfectly natural for a planet coming out of the last LIA. William Haas, Thank you for your most interesting contributions above. I wonder, where can a layman acquaint himself with your findings? Why is there so little material available that explains these ideas to a broad non-expert audience? Why do sceptics not seem to attach enough emphasis to the physics of CO2, greenhouse gases and non-greenhouse gases? From the video below it would appear that the physics of CO2 hardly supports the pivotal role ascribed to this gas by adepts of AGW. Why is this knowledge not exploited with more vigour and confidence by sceptics? I don’t get it, you applaud William for his contributions which are plain wrong and then link to a video that explains the greenhouse effect pretty well … the exact opposite of what William wrote. Are you trolling him? Will’s contribution is not wrong. You just don’t like the facts because they destroy your baseless AGW “belief” system. It is the non-greenhouse gases that are more likely to trap heat energy because they are such poor LWIR radiators to space compared to the so called greenhouse gases. No, you haven’t understood how radiative heat transfer works. Something which doesn’t radiate LWIR also doesn’t absorb it and thus doesn’t block any radiation from getting to space. Heat transport by conduction and convection dominates over heat transport by LWIR absorption band radiation in the troposphere. Good absorbers are also good radiators. In the upper troposphere and the stratosphere it is the so called greenhouse gases that absorb heat energy transported by conduction and convection and then radiate that energy out to space. Conduction and convection are not dominating. Radiation dominates, but the insulating effect of greenhouse gases causes the net radiation flux from the surface to space to be smaller than it otherwise would be. That’s the main reason why it is warm at the surface (on average). More so called greenhouse gases improve the Earth’s radiation to space and hence have a cooling effect, not a warming effect. Conduction and convection DO dominate the control of the lower atmosphere. There is zero evidence that enhanced atmospheric CO2 causes warming.. or you would produce it. Greenhouse gases do not alter the overall transport of energy from the surface, they aid it.. especially H2O, no insulation effect from CO2, its just another conduit for energy transfer. Absorbs in a tiny thin weak band, and thermalise immediately for convection and other air mass transfers to take over. You really do have to get away from your junior high lack of understanding of atmospheric physics, seb, it is holding you back from making a rational worthwhile contribution to basically anything..
Kenneth, in the Ollila summary am I being dense, or is there an error? So I understand that the overall temperature increase since ’79 is .4C, but that 2016 had a spike of .85C. So the average yearly increase would be about .01C, but 2016’s increase was 85 times this!? Thanks for all these summaries– enormously helpful. So I understand that the overall temperature increase since ’79 is .4C, but that 2016 had a spike of .85C. The 0.85 C is the IPCC’s estimate (from HadCRUT) for the temperature increase from 1850 to 2012. 0.4 C of that 0.85 C of total warming occurred between 1979 and 2016. The “for 2016” means extending through to 2016. The 2016 spike has now almost completely disappeared…. So, a degree or so warming out of the COLDEST period in 10,000 years. How the heck did this ever become ANYTHING but REALLY GOOD NEWS !!!! And yet it was the third warmest April ever recorded. Sure, its warmer than the anomalously cold LIA, but most of the 9000 years before that would have been much warmer. The real problem is that in the energy absorbing region, the Tropics, satellites have 2018 in 26th place. Unfortunately, it looks like there is a cooler period on the way. Kenneth– Ah, now I see. Thanks. Great to see that the link between CO2 and water vapor ain’t so. Certainly cuts the legs out from under any remaining science pretence.